It's been about 2 1/2 years since I started my journey into classical music and I'm pleased to report that not only do I still enjoy this wonderfully diverse music, but I've found the more I listen the more I love it. I'm listing a few of my favorite recordings I purchased this past year. These selections will bore most of you because I'm still a neophyte acquiring the basics. However, feel free to list some standouts that you purchased last year. This is the best CD I bought last year. Sublime is a term that is entirely overused in the classical music realm, so I cringe a little as I type the word... However, one wonders how one person can possess the immense talent needed to write such eloquence. This CD was the surprise of the year. I bought it because I read so much about the Grieg PC - and I wasn't disappointed, in fact I was thrilled. However, I wasn't expecting the Schumann PC to have such an impact - gorgeous. This CD is my introduction to both composers and I will surely be acquiring more of their work this year. This was my introduction to 21 & 23... This CD is a close second to the Brahms for my favorite of 2007. I've listened to another recording of Moonlight many times which I enjoy more than this version, but 21 & 23 are devastatingly powerful on this recording. LvB on a piano is at one moment furious and another moment gentle and he covers all the ground between with perfection. Can enough ever be said for his talent? I was immediately hooked on PC 1 and played it many times before taking a moment and letting the Rachmaninoff PC 2 play and at first I didn't get it. However, with repeated listens the brilliance of the music began to reveal itself to me and now I find the whole CD to be a complete joy. I was blown away by the 4th - I believe the first movement is one of the most powerful and dramatic pieces of music ever written. The entire CD is amazing and it leaves me thinking, "All of this for $10?" A bargain. Mravinsky is a pretty astonishing maestro. 1. Golijov -- a contemporary composer on Deutsche Grammophone, isn't that in itself an indication that a most unusual composer has emerged? I'm still catching up with Chalkie here but I got Ayre (coupled with Berio's Folk Songs), Ainadamar, Oceana (with Tenebrae and Three Songs) and chamber music with the St. Lawrence Quartet and the Ying Quartet (EMI Classics). First-rate! 2. I expanded my coverage of British composers with music by William Alwyn, William Wallace and Edmund Rubbra. Of these three composers, I intend to purchase more Rubbra. Also just acquired Bennett's The Mines of Sulphur. 4. American music: I finally acquired Douglas Moore's The Ballad of Baby Doe and Howard Hanson's Merry Mount, the latter turning out to be an extremely pleasant surprise. That's about it in terms of notable discoveries. These selections will bore most of you because I'm still a neophyte acquiring the basics. A very nice post, keaggy. What's implied in this comment is an apprehension I sometimes also feel because there are posters here who can speak authoritatively about the full range of performances of a particular piece. But I've also learned that's the world of music is a big one, and we all can offer an interesting and unique perspective. Since you like the Tchaikovsky PC 1 and Rachmaninoff PC 2 (also a pairing I listened to a greal deal in my earlier listening days and still do) I wonder if you'd gotten to Rachmaninoff PC 3, yet? You might enjoy the movie 'Shine', a controversial but very interesting movie; the 'Rach 3' as they call it is central to the story. I second Golijov; not enough time at the moment to summarize my recent joys and discoveries - I'll try that later. Last edited by slofstra on Sun Feb 17, 2008 4:03 pm, edited 1 time in total. After that it's any one of the many Mahler recordings I got last year. I suppose the best is Szell with the Cleveland playing Mahler's Fourth. I got it on vinyl. I picked it up in an Oxfam Book shop in Dublin. Thanks for your kind words and your suggestion on "Rach 3." I will put it on my list. One of the reasons I gave classical music a try is because of music from films like "2001", "Star Wars", "Amadeus", and "Shine." keaggy220 wrote: ... feel free to list some standouts that you purchased last year. Congratulations on all your purchases. I envy you, your freshness to all of this fine music ... the ability to hear some of these pieces for the first time. Like some others here, I've purchased a couple hundred CDs this past year, both new stuff and old, including quite a few "complete" sets, including two of Beethoven's music. Many were the joys delivered to my mailbox (which I've situated right next to the disc player so I won't lose any time listening to new acquisitions). Pettersson: Complete Symphonies / Albrecht, Arnell, et al on CPo ... I had heard a couple of these works over the years but relish to finally have access to all 16 symphonies and the opportunity to hear them in chronological order and follow the progression of the composer's symphonic vision. A wonderful acquisition. Shostakovich Edition - Symphonies, Concertos, etc on BRILLIANT CLASSICS ... a set that is valuable for either the symphonies or string quartets alone, and which proves a treasure to have both, and a lot of other stuff thrown in for good measure. A true delight that helped me bring in Dmitri's 100th birthday in musical style. Ries: Complete Symphonies / Griffiths, Zurich CO ... which up till the time I received this box was generally unknown music to me. I didn't know whether to laugh my head off or weep when I heard poor Ries's Fifth Symphony. Those of you familiar with Ries and his worship of Ludwig van and of the history behind that Fifth Symphony will well understand what I mean. 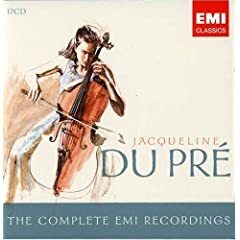 Jacqueline du Pré: The Complete EMI Recording ... a box set which supplements recordings I already had but provides a wealth of "new" recordings from that angel of the cello, Jacqueline du Pré. This is a collection to which I shall return again and again. Haydn: The Complete String Quartets / Angeles String Quartet on PHILIPS ... a set I bought after reading recommendations on this web site, and a set of quartets to satisfy for a life time. 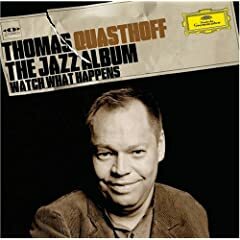 Thomas Quasthoff The Jazz Album, produced by German jazz star Till Brönner. Hey ... you might not like every song, but on Valentine's Day I called my wife into the listening room specifically to hear Quasthoff's take on "My Funny Valentine". That one number is worth the price of the disc. And finally, a borderline "classical" work ... Stefano Battaglia Re: Pasolini on ECM ... this remains one of the most played acquisitions of 2007, and it is on as I write. A beautiful jazzy meditation that is guaranteed to please. Sure, there were lots more purchases. Some great surprises (like that Ries Fifth Symphony), some "dogs" (Okay ... the jury is still out on Tomas Marco's three Sinfonias on a Discobi disc I picked up from Berkshire, but I don't know how many more chances I can give this one to finally click.). But for one for whom in semi-retirement listening to music is a major pastime, the year has proved a delight. And 2008 is off to a great start, too. That is indeed a great set! It remains my favorite versions of those three Tchaikovsky symphonies ... and I've been listening to those recordings for quite a few decades now. Never tire of 'em. keaggy220 wrote: It's been about 2 1/2 years since I started my journey into classical music and I'm pleased to report that not only do I still enjoy this wonderfully diverse music, but I've found the more I listen the more I love it. I'm listing a few of my favorite recordings I purchased this past year. These selections will bore most of you because I'm still a neophyte acquiring the basics. However, feel free to list some standouts that you purchased last year. First of all, Keaggy, I don't find your comments boring. You have a fresh approach to the music, and your discovery of "basic" works is an experience worth conveying. I can still say, after 40 years of listening to classical music, that there is a thrill to discovery, whether it is a work that I have not heard before, or a captivating performance of a familiar work. In that context, I'll mention one CD I purchased in 2007: Scottish Fantasies for Violin and Orchestra; Rachel Barton Pine, Violinist; Scottish Chamber Orchestra, Alexander Platt, Conductor (Cedille CDR 90000 083). This 2-CD set contains one big familiar work, Max Bruch's Scottish Fantasy, plus unfamiliar works by Alexander Mackenzie, John McEwan, and that noted Scotsman, Pablo de Sarasate! Rachel Barton Pine is one of my favorite violinists, and this set is a total delight. I've been collecting classical for about 15 years, and I can't believe how much I'm still spending. And having recently purchased an SACD player, I'm afraid the list is going to be long this year. Auryn/Schubert string quartets (these are the most immaculately played and recorded string quartets in my collection). - Matthew Best - a slew of recently purchased CDs - but just getting into them. keaggy220 wrote: These selections will bore most of you because I'm still a neophyte acquiring the basics. However, feel free to list some standouts that you purchased last year. Everyone has to start somewhere. The more you listen and the more you talk about what you like, the more discriminating the ear becomes. I guess my standouts for the year would be a ton of medieval Sephardic Jewish music, the 10 or so discs of Jo Stafford, several Dinah Shore discs, and the EMI box set of Ravel's and Debussy's orchestral music by Jean Martinon that a friend gave me for Xmas. Thanks for bring that up actually. Because I wasn't trying to endorse specific CDs, per se. I feel a lot of push and pull between listening to work that is entirely new, and there is so much, and drilling down in familiar territory. 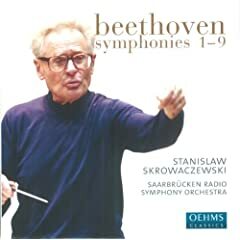 After ignoring Beethoven's symphonies for a number of years, I've enjoyed an exercise in listening more closely, and finding this rewarding even though specific recordings may not be the best. (See the Eroica thread for an example). Previously I did not see much value in listening to multiple renditions of the same work; but that aspect of classical music has opened up for me in the last year, probably because of the influence of this board. That being said, I do like Rattle's 7th and 8th; I dislike his Eroica. But I'm finding my response even changes from movement to movement. Rattle's approach is to create a lot of excitement - for example the piccolo is often quite pronounced and demonic - and a very bright veneer to the string section, an approach which is not always appropriate. It sounds great at first blush though. Going back and forth between the Haitink and Rattle sets is very instructive. If one takes this approach of listening to understand music and performance art a little better then one could even enjoy a very bad performance, depending on what makes it so bad. A case in point is Gould's Appassionata performance which is almost so bad it's good. (The intellectual stimulation in that case is trying to determine what in the world he was thinking to try and play it in that manner). Finally, to Rattle's credit I think he's one of the great ones - willing to take chances. I mean how do you do a Beethoven symphony set and still make your mark. Too bad it didn't work that time. He's definitely worthy of our attention. I really think he has done better on the edges of the repertoire rather than trying to reinvent the core German stuff. Imagine what the BPO could do with a complete Norgard set. slofstra wrote: Finally, to Rattle's credit I think he's one of the great ones - willing to take chances. I mean how do you do a Beethoven symphony set and still make your mark. Too bad it didn't work that time. He's definitely worthy of our attention. What about this one? It has escaped my notice previously. I know you like his Brahms PC 1 with Gilels and the Haydn London+ symphony set is great. Price - under $30. There's also a Cluytens set that looks recent. Under $20. Also, it must be remembered that although we're talking about Rattle and the BPO the Beethoven set was with the VPO. Sheesh. Too bad, as I was hoping. If he had Rattle's hair perhaps he could do better Beethoven. Whereas Haydn is more buttoned down and probably right up his alley. Since the Vanska is not yet available as a complete set is there one in particular that stands out. 1. Shostakovich: The Golden Age, Op. 22, complete ballet (1930) (2'23:42)--Jose Serebrier, cond. Royal Scottish National Orch.--2 Naxos CDs, rec. 2006. The story line is standard, heavy handed Soviet agitprop boilerplate. Per the synoptical short liner note on the back cover of the set, it "revolves around the visit of a Soviet football team to a Western city (referred to as 'U-town') at the time of an industrial exhibition, only for its heroic sporting and social endeavors constantly to be undermined by hostile administrators, decadent artistes and corrupt officials. Even before its premiere Shostakovich had prepared a suite, including the famous Polka...,which barely hints at the dissonant harmonies and intricate contrapuntal designs to be found elsewhere in the ballet. This recording is the first to present the ballet complete with all repeats observed, enabling listeners to assess the ballet in all its exhilarating, and, at times, anarchic intensity." Incredibly, despite its story line not having made any waves in terms of Soviet orthodoxy, the Soviet critics panned the work, mostly because of is adventurous, dissonant harmonies. This lukewarm response is, apparently, what discouraged performances of the complete work until past the end of the 20th century. But, I must say, for those of us who are still here, it was worth the wait. This is a magnificent, landmark recording, vigorous, lively, and exciting. It is extraordinarily well paced and conveys a great dramatic sense on the part of both composer and conductor. Interest never flags, and the sound is superb. Highly and urgently recommended. 2. Karlowicz, Mieczyslaw (1876-1909): Music for the White Dove Inc. Mus., Op 6: Bianca da Molena, symphonic prologue (11:11) |Serenade for String Orch, Op 2 (21:25) |Symphony, Op. 7 "Rebirth" (39:45)--Gianandrea Noseda, cond. BBC Phil.--MHS CD, lic from Chandos.--I will hazard a guess as to why Karlowicz, despite his evident mastery as a composer, is so little known. His music has Brahmsian and Wagnerian influences and tendencies in about equal parts. That sort of fusion, or hybridization, didn't have much of a constituency during his lifetime, and, unfortunately, still doesn't. But you are missing out on a truly great composer if you choose to ignore his work. 3. Honegger: Chamber Music--4 timpani CD box. I have never heard of any of the musicians involved in this project except for cellist Raphael Wallfisch, but these are fine performances. CD1 has 3 violin sonatas, a sonata for solo violin, and 2 very short works, each under 3 minutes, for violin and piano. CD2 has a sonatine for 2 violins, a sonatine for violin and cello, a sonata for cello and piano, a sonata for double bass and piano, and a sonata for viola and piano. Also a 2:41 second Paduana for cello solo, and a 5:03 Piano Trio. CD3 has 13 pieces, each of which includes at least one wind or brass instrument, the longest of which is the 9:18 Rapsodie for 2 flutes, clarinet, and piano. CD4 has 3 substantial 3 movement string quartets, and a 3 movement 6:41 piece called Paques a New York (1920) for mezzo-soprano (Fusako Kondo) and the Qutuor Ludwig. Although Honegger is best known for his orchestra and choral works, he himself considered his chamber music to be the core of his oeuvre, and this set firmly establishes the reasonableness of that belief. These are fine performances of wonderful works, well recorded, and are highly recommended. 4. Grieg: Peer Gynt (Premier Recording of the complete music for Ibsen's Dramatic Poem) (101:47)--Per Dreier, cond. London SO, Oslo Phil Chorus, Toril Carlsen, soprano, Asbjorn Hansli, baritone, Vessa Hanssen, mezzo-soprano, Kare Bjorkoy, tenor--2 CD Unicorn-Kanchana set. Ibsen's work was staged a number of times during Grieg's lifetime, and each production was different. Some had massive cuts, some a few, all different from the total manuscript, and from each other. Grieg wrote music for these productions at various times in his life to meet exigent circumstances. Per Dreier has done us the estimable service of gathering every scrap of music Grieg wrote for Peer Gynt together and working it into a fine performing edition for the first time, and then he recorded it. Here it is. And a magnificent, lively, and engaging performance it is, too. Listening to it is like hearing the work for the first time, all fresh and new. Even though it is from 1987, it is an AAD recording, but very good, for all that. Just as an aside, I must say that the Arabian Dance sounds like it was, ah, the inspiration, let us say, for Richard Rodgers' March of the Siamese Children from The King and I. 5. Gade: Violin Sonatas 1, 2, & 3--Dora Bratchkova, violin; Andreas Meyer-Hermann, piano. cpo CD. These are suprisingly beautiful, lushly lyrical works with real emotional as well as formal depth. Highly recommended. 6. Bruch: 3 posthumously published chamber works--String Octet (24:48 ) |Piano Quintet (28:11) |String Quintet (25:51)--Ensemble Ulf Hoelscher--cpo CD. I find these chamber works altogether more interesting, more tuneful, and more sophisticated than most of Bruch's more popular orchestral music. 7. Gershwin: Porgy and Bess (Restored Original 1935 Broadway production version) (1:24:55)---John Mauceri, cond. & reconstructor, Nashville Sym Orch. & Cho, Blair Childrens Chorus members, Tennessee State Univ. Band members, Alvy Powell, (Porgy), Marquita Lister (Bess), Nicole Cabell (Clara), Robert Mack (Sporting Life), Leonard Rowe (Jake), Monique McDonald (Serena), Linda Thompson Williams (Maria), Lester Lynch (Crown)---2 MHS CD set, lic from Decca, recorded 2006. 10. Mahler: Kindertotenlieder (27:18 ) |5 Ruckertlieder (19:28 ) |Lieder eines fahrenden Gesellen (Songs of a Wayfarer) (17:40) |Ich bin der Welt abhanden gekommen (Ruckert) (6:52)--Dame Janet Baker, mezzo-soprano, Sir John Barbirolli, cond. New Philharmonia Orch (5 Ruckertlieder), Halle Orch (all others)--EMI GROC series CD. These are, of course, sublime, magnificent performances. The GROC series often exaggerates the meaning of greatness. Not in this case. Urgently recommended. 11. Beethoven: Piano Sonatas (complete)—Annie Fischer, piano—Hungaroton. 12. Brahms: Sym 1 |Tragic Overture--Bohm, cond, BPO (Sym, 1960), VPO (Over, 1977)--DG Eloquence (Australia). I have long had the Sym on LP and considered it absolutely the greatest MOR recording of the First Sym ever done. I am happy to report that this CD transfer is a faithful copy of the original. So far as I know, it is available only from Australian sources; I got it from Buywell there. This is a truly great performance that belongs in every collection. 14. Shostakovich: String Quartets (complete)—Shostakovich Quartet—5 CD Regis set. 15. Schubert: Syms 3, 5, & 6--Beecham, cond. Royal Phil. EMI GROC CD. There's a blurb on the cover from a Gramophone review, "...these extremely charming and elegant performances, with exquisitely polished playing, afford deep pleasure..." And may I add, viscerally exciting, too? None of the sorts of atrocities Sir Thomas was noted for committing against Handel and Haydn are in evidence here. These are just superb, involving performances. Arthur Foote was an American composer, born in Salem, Massachussets to Caleb Foote, who had been an orphan at a young age, but made a fine life for himself, starting out as an apprentice at a local newspaper, later becoming its editor and co-owner, active in school affairs and his church, and getting elected to the Massachusetts House of Representatives. Arthur studied at Harvard with John Knowles Paine, among others, earning a bachelor’s degree in 1874; in 1875, he became the first American to be awarded a Master of Arts in Music degree from Harvard or any American college or university. Despite the fact that he was thoroughly American, however, his music is firmly rooted in the middle European, mid-Romantic idiom of Schumann, Brahms, and Dvorak, with just a dash of Wagner thrown in. In form and style, these works are thoroughly derivative, but he is no pale imitation, like, say, Bruch or Goldmark, of the real masters. His familiarity with sonata form is thorough, and his musical arguments are rigorous, complex, sophisticated, and often beautiful. He is a composer well worth anyone’s getting to know. One of my goals this year is to give Debussy another listen... I invested in some of his music last year and I didn't quite get it. I'm incredibly stubborn so I'm confident that one day I will enjoy his music - I just hope it's this year. RebLem wrote: 1. Shostakovich: The Golden Age, Op. 22, complete ballet (1930) (2'23:42)--Jose Serebrier, cond. Royal Scottish National Orch.--2 Naxos CDs, rec. 2006. The story line is standard, heavy handed Soviet agitprop boilerplate. Per the synoptical short liner note on the back cover of the set, it "revolves around the visit of a Soviet football team to a Western city (referred to as 'U-town') at the time of an industrial exhibition, only for its heroic sporting and social endeavors constantly to be undermined by hostile administrators, decadent artistes and corrupt officials. Even before its premiere Shostakovich had prepared a suite, including the famous Polka...,which barely hints at the dissonant harmonies and intricate contrapuntal designs to be found elsewhere in the ballet. This recording is the first to present the ballet complete with all repeats observed, enabling listeners to assess the ballet in all its exhilarating, and, at times, anarchic intensity." Incredibly, despite its story line not having made any waves in terms of Soviet orthodoxy, the Soviet critics panned the work, mostly because of is adventurous, dissonant harmonies. This lukewarm response is, apparently, what discouraged performances of the complete work until past the end of the 20th century. Very nice list - thanks for taking the time to post it. I made a note to remember the Grieg. How do you like the LvB Piano Sonatas? I love the Annie Fischer set, but then almost everyone knows that many regard them as the very best, so I didn't bother to elaborate. Obviously, therse are what I consider the best I listened to for the first time in 2007. But I feel the same about all the others, too, including the ones that have few other advocates. I generally listed them in the order of importance, at least as I see them, if that gives you a clue. Last edited by keaggy220 on Thu Feb 28, 2008 10:09 pm, edited 1 time in total. Do you like these better than Takacs? Curious because I'm just beginning to listen to the Quartets. slofstra wrote: Do you like these better than Takacs? Curious because I'm just beginning to listen to the Quartets. The price is outta sight though. The Gulda set is a great bargain at $30-$40. The stereo Kempff set is now also at moderate price. Kovacevich is also not bad in price; I think you said you liked that one, chalkie. Consensus seems to be that the Kempff mono and Fischer sets are the absolute best and the price follows along with that consensus. Then there's the Kuerti set - that's the one I would get. Ask cliftwood. slofstra wrote: The price is outta sight though. The Gulda set is a great bargain at $30-$40. The stereo Kempff set is now also at moderate price. Kovacevich is also not bad in price; I think you said you liked that one, chalkie. I don't have, and have never heard, the Takacs set. I thiought the Gewandhaus SQ recordings of the Beethovens were among the best MOR recordings I have ever heard. I do prefer the Yale Quartet recordings of the Late Quartets. I also have the Alban Berg set of all of them, which is rather reserved and classical, and the Smetana Quartet cycle, which emphasizes the romantic side of Beethoven. I also have the Emerson Quartet cycle, which is emotionally cool, but not in a classically restrained way, just in a way I feel says more about the temperament of the quartet members than it does about an intellectually considered approach to the music itself. I used to have the Quartetto Italiano set on LPs. They are excellent MOR recordings as well, but I thought the instruments were a little softer edged than they are in the Gewandhaus set--I don't know what instruments they play, but the Italians have a sort of Strad sound, whereas the Gewandhausers has a sharper edged Guarneri sort of sound, with a little more bite, which is the sort of sound I prefer in the Beethoven quartets. My POV is that any one of 10 complete Beethoven sonata sets exhibit great artistry and will do as a starter. Why spend $180 if you can get it for $40? As well opinion on which set is best is by no means unanimous and any of the great ones has its detractors as well. One has to take superlatives with a grain of salt. Personally I started with the Kuerti set which I still really enjoy and later added Arrau and then Schnabel. I also have lots of singles. I may still add the Brendel set. The Kovacevich also looks worthwhile. I doubt if I'll purchase Fischer because of reservations expressed by some reviewers; I'm just not going to be able to listen to that many sets. (I might focus on a subset of Fischer's). I would not begin with the Schnabel though because of the less than ideal sound and 'interesting' style. If you pick a good budget set and then combine that with some singles of this or that pianist you're gonna be busy for quite a while. Then at some point you could start looking at the more expensive sets and rounding out the collection, before reaching for the final plateau, Lance-hood. BTW, chalkie (or anyone), what do you think of the Kovacevich set? slofstra wrote: My POV is that any one of 10 complete Beethoven sonata sets exhibit great artistry and will do as a starter. Why spend $180 if you can get it for $40? As well opinion on which set is best is by no means unanimous and any of the great ones has its detractors as well. One has to take superlatives with a grain of salt.BTW, chalkie (or anyone), what do you think of the Kovacevich set? slofstra wrote: Why spend $180 if you can get it for $40? As well opinion on which set is best is by no means unanimous and any of the great ones has its detractors as well. One has to take superlatives with a grain of salt.BTW, chalkie (or anyone), what do you think of the Kovacevich set? If you just want the music and can't tell the difference between Jando and Schnabel or Kempff, why not buy Naxos? On the other hand . . . wait . . . there is no other hand . . . . anybody that gets on disc is going to be reasonably decent and won't be far off the standard. You can't get farther apart than Kempff and Schnabel. Although I agree with the philosophy I wouldn't begin with Schnabel. And I'm told the Anne Oland 10 CD set for $18.99 is not the *ahem* highest quality. Also the Naxos is not cheap if you buy the individual CDs, 8 of them at $9. You'd do better with Gulda or Kovacevich. I missed the Clockwork Orange reference. That's what the 'Alex' was. Okay droogies. Gorgeousness and gorgeousity made flesh, gravity all nonsense now. slofstra wrote: I missed the Clockwork Orange reference. That's what the 'Alex' was. Okay droogies. Gorgeousness and gorgeousity made flesh, gravity all nonsense now. Oh Chalkie don't talk to me about BluRay. I actually bought an expensive Arcam HD DVD last year and soon I may not be able to get disks to play on it. Seán wrote: Oh Chalkie don't talk to me about BluRay. I actually bought an expensive Arcam HD DVD last year and soon I may not be able to get disks to play on it. My older brother had a superb betamax player and a small library of talpes, they were very expensive at the time too. We seem to have a family penchant for investing in the wrong technology.